Remind them your love for only grows with this take on the classic initials carved in a tree. True love doesn't grow on trees, you know. Show your partner how much you value your special bond (and that you're just as crazy about them today as you were in the early days) with this nostalgic serving tray, made from mango wood with a laminate top and felt feet underneath. Make it an anniversary or wedding gift to remember by personalizing one of the trees with you and your loved one's initials—the two lovebirds a few branches over add to the sweet, romantic feel. Made in Providence, Rhode Island. 13.5" L x 13.5" W x 2.25" H; 1.5 lbs. Very pleased with this product! Sweet design and good quality. Pretty enough to display but also functional. Makes me smile! Will be used to collect cards at a wedding, it's cute and functional but I would say it looks a lot cheaper in person than it does in the site. Also when I ordered it I ordered the color that was displayed because when I clicked on the alternative there was no picture so I couldn't tell what it would look like. So easy to personalized and have it sent as a gift. Loved this tray. Even nicer than pictured. Very impressive. Proud to give it. 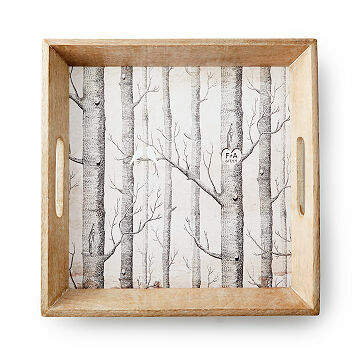 I purchased this tray for our daughter and son-in-law for their 10th anniversary. I wanted to find something personalized yet practical. This tray fit the bill. I think they will really enjoy it. As it is a gift that hasn't been given yet, I can't speak to its durability or how they will choose to use it. As you can see from the measurements listed, it certainly isn't a large tray, but that is reflected in the price. Overall, a nice personalized gift for this price range. Thank you for this beautiful product. My niece and her husband enjoyed receiving a unique, personalized wedding gift that was "off-register." I suspect that this tray will be displayed vs used! Multi functional. Could be used as a display piece, either flat or on a stand. It is also a functional tray and could be used for that purpose.